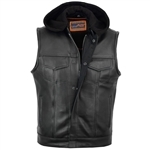 Premium quality leather motorcycle vests for men including popular styles like anarchy leather vests with collar and classic biker styles. 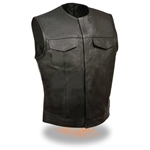 At leather Bound we offer a wide variety of leather motorcycle vests perfect for biker clubs or even lone riders. 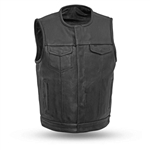 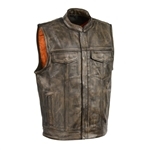 We stock leather vests for any budget, weather you are looking for a inexpensive biker vest or you want a premium leather motorcycle club vest will all the bells and whistles. 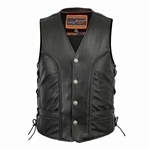 You are sure to find the perfect vest for you when you shop at Leather Bound, browse our selection of black leather vest with gun pockets and classic biker style vests with side laces and more. 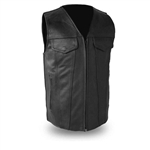 We inspect all our vests for quality so rest assure you are receive only the best when you order from us. 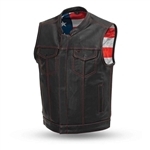 Live local? 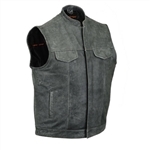 Visit our Pennsauken New Jersey location to check out our selection and find the perfect fitting vest. 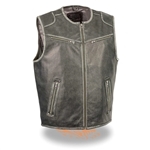 Consider a black denim motorcycle vest for the summer months or simply just to add to your biker wardrobe.